For over 23 years, every Wednesday night, St. Mary’s opens the doors of our parish hall to serve a community dinner to any and all guests. This powerful outreach is more than just a hot meal; it is about dignity and compassion toward those who need a helping hand. To make a donation to this vital ministry, please click on the link below and select Mary’s Kitchen. Mary’s Kitchen was started in the early part of 1994 by Barbara Hendry and was approved by The Rev. Thomas T. Pittenger. A large group of parishioners met to organize Mary Kitchen’s and served its first meal on October 26, 1994 to 38 guests. The ministry in “Feeding the Hungry” began in the old kitchen in Smith Hall. Soon new equipment was needed to replace electric stoves and ovens, add a much-needed ice machine, walk-in cooler/freezer and other items needed to provide a hearty meal each Wednesday evening. When St. Mary’s purchased the old Martin County Library property which is now the Pittenger Center, a new commercial kitchen was designed and included with the buildings. A new and larger walk-in cooler/freezer, new ice machine, convection oven, commercial dish machine, pots, pans and other needed items were added. Mary Kitchen served its first meal on October 26, 1994 to 38 guests. There have been over 214,000 meals served. 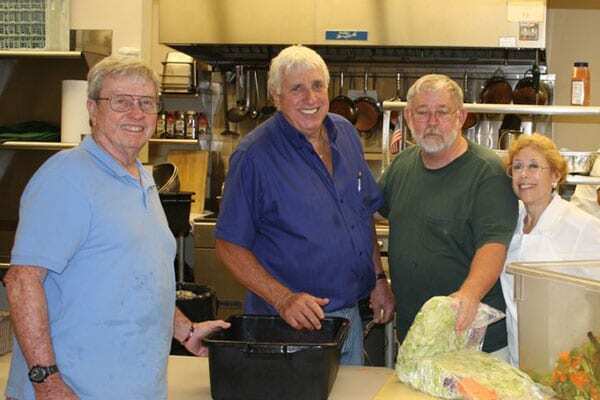 Mary’s Kitchen has also partnered with The American Legion, V.F.W., and the Salvation Army, by preparing 75 meals each week to feed the homeless veterans within the Martin County area, distributed by the Salvation Army Canteen van.